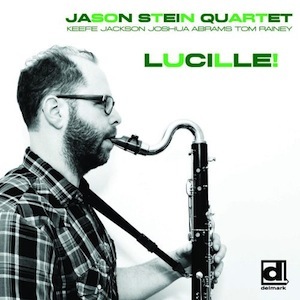 Jason Stein Quartet - Lucille! Lineup - Jason Stein: bass clarinet; Keefe Jackson: tenor saxophone, contrabass clarinet; Joshua Abrams: bass; Tom Rainey: drums. Chicagoan bass clarinetist Jason Stein flaunts a categorical, spirited sound that can be concurrently explosive and melodic. For the new outing, Lucille!, he reunites his exciting quartet to explore compositions he penned plus hard-groovin’ renditions of classics by Charlie Parker, Thelonious Monk, Warne Marsh, and Lenny Tristano, in a sort of a conceptual follow-up to his previous album, The Story This Time, released in 2013. As it happened before, Stein teams up with Keefe Jackson, who alternates between tenor saxophone and contrabass clarinet, to create an unabashed double-horn frontline. He also probes an unprecedented rhythm section with regular bassist Joshua Abrams and the new-arrived Tom Rainey in the drummer's chair, replacing Frank Rosaly. Opening with Rainey’s jittery drumming, here empowered by unexpected thumps, Warne Marsh’s “Marshmallow” thrives with a vivid bass pizzicato, falling into a modern swing suffused with unisons and polyphonies delivered by the reedists, who show an intricate, powerful, and still amiable phraseology. Following a similar approach, “Wow” and “April”, both by Lennie Tristano, bestow this pleasurable insouciance that wants to tell us that swing can be something else nowadays but is still alive! There’s a direct parallelism with the original versions and its force comes not just from the coincident boppish lines in the head but also from the reciprocity of ideas. Recreating different paces, intensities, and moods within a well-defined structure, “Halls and Rooms”, a Stein’s original, has Rainey’s brilliant rhythmic inventions constantly popping in my ears. The raucous inflections of the contrabass clarinet can be heard on Parker’s “Dexterity” and Monk’s “Little Rootsie Tootie”, bringing amusingly attractive low-pitched tonalities to pin down a confluent steadfastness. The latter piece starts by embracing a thunderous cacophony before entering in an immodest rasping celebration of hooky clarinets immersed in abstract crosstalk. Carrying another unflinching swinging verve at the base and elated melodies on the top, “Roused About” showcases the wide-eyed energy of the improvisers. Distinct from all the rest, “I Knew You Were” stratifies spiritual intonations, resorting to droning bowed bass, irregular cymbal shatters, and percussion chops scattered throughout. Freedom and unity are claimed through devotional improvisations and counterpoint whose kinetic nature perpetuates the depth and the fervor. In addition to inflaming classic pieces with their scintillating straightforwardness, Jason Stein and his partners build interesting originals with a panoply of patterned and uncommon sounds that have much to be admired.